I felt that the lone star block on the tree skirt center was a bit too simple and decided to add a border to the tree skirt to dress it up a bit. I’m always looking for ways to make half square triangles easier and faster to make. 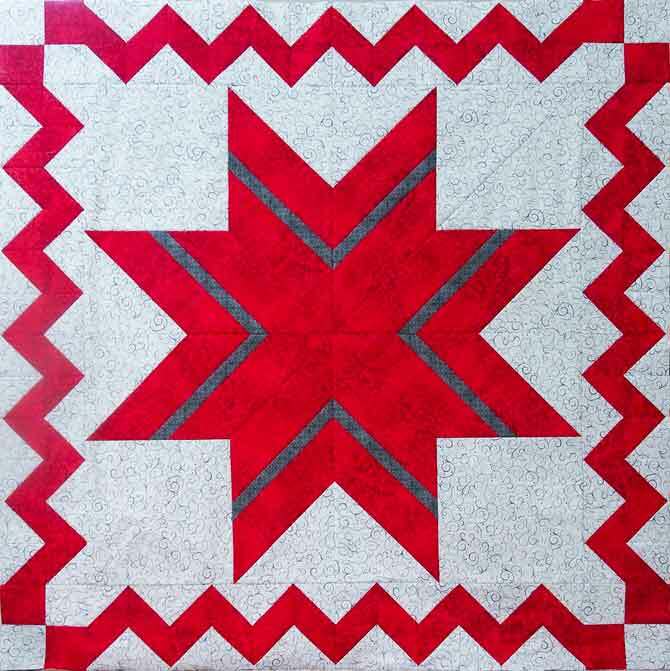 They are such an important part of quilting and are found in so many blocks, patterns and quilts. One day at my LQS I found a cool gadget I should try today. 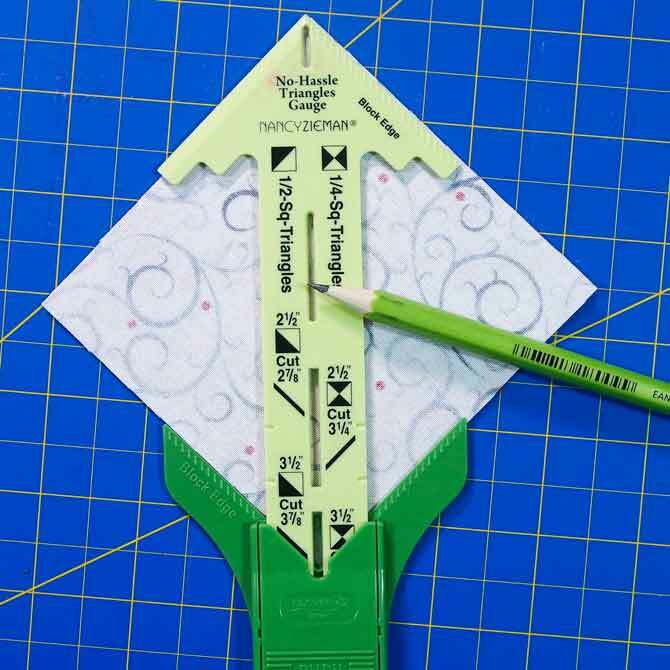 HST made easy with the No-Hassles Triangle Gauge from Clover is going to be used to create a classy border for this lone star tree skirt. 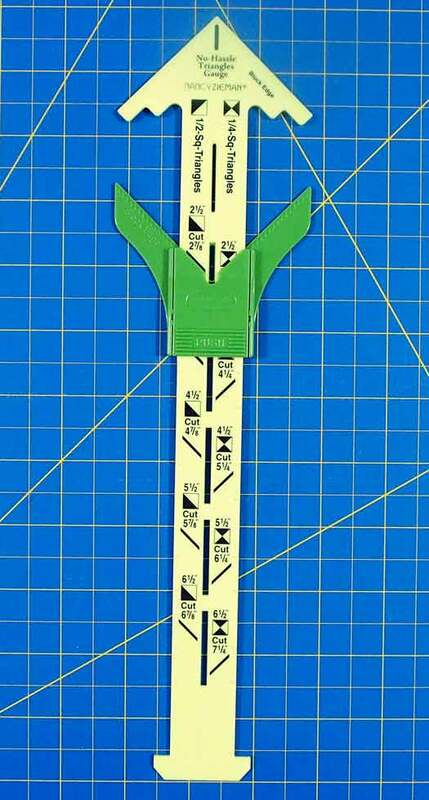 Not only is this gauge for half square triangles but it’s also for quarter square triangles. Today though I’m only making half square triangles. 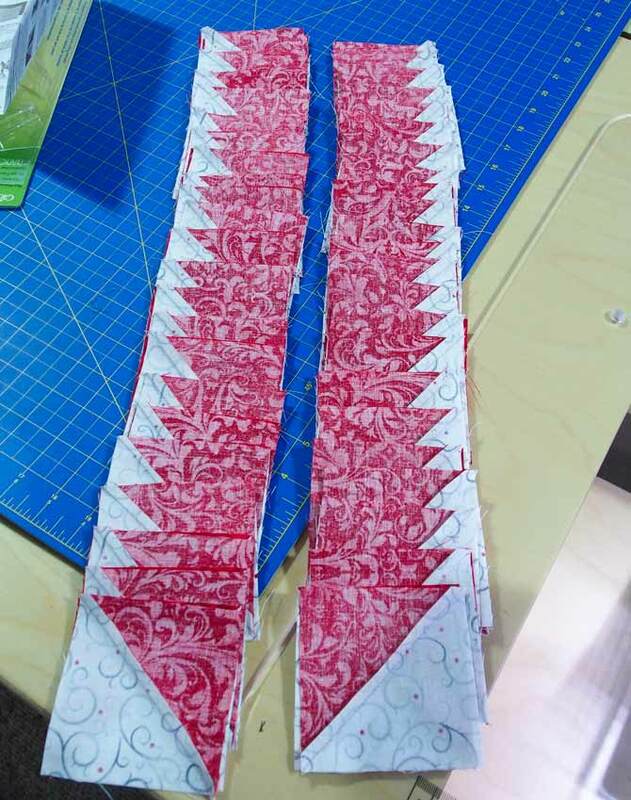 Back to re-configuring the border… I decided to make 3″ finished half square triangles. This means I only need 96 total – 24 per side. For the 3½″ unfinished half square triangles the squares need to be cut at 3⅞″ each. 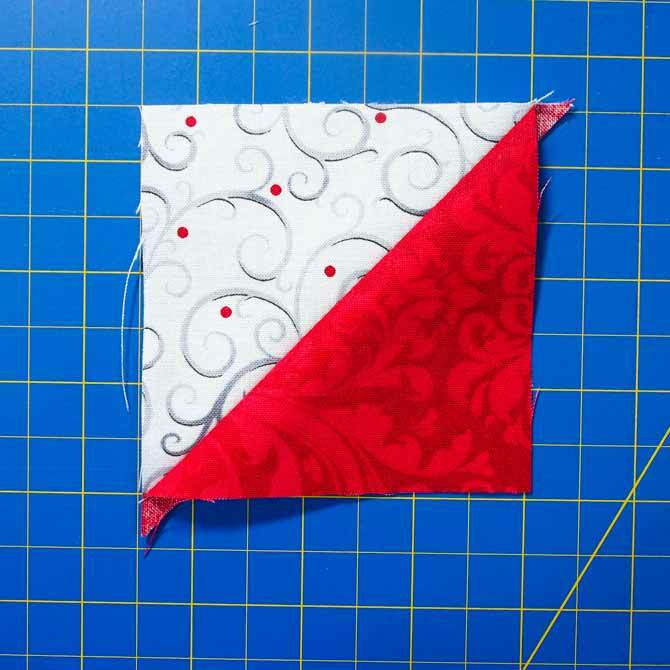 This will result in a 3″ finished half square triangle. 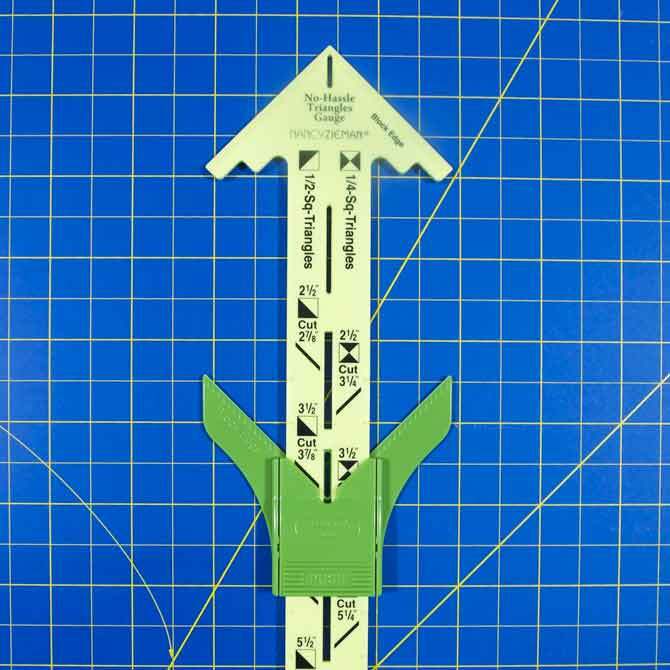 Bring the wing tip green piece down to the 3⅞″ mark by pushing in the button that says push and sliding it down the center plastic piece. Place the fabric squares under the gauge and line up the edges of the fabric with the green wing tips. 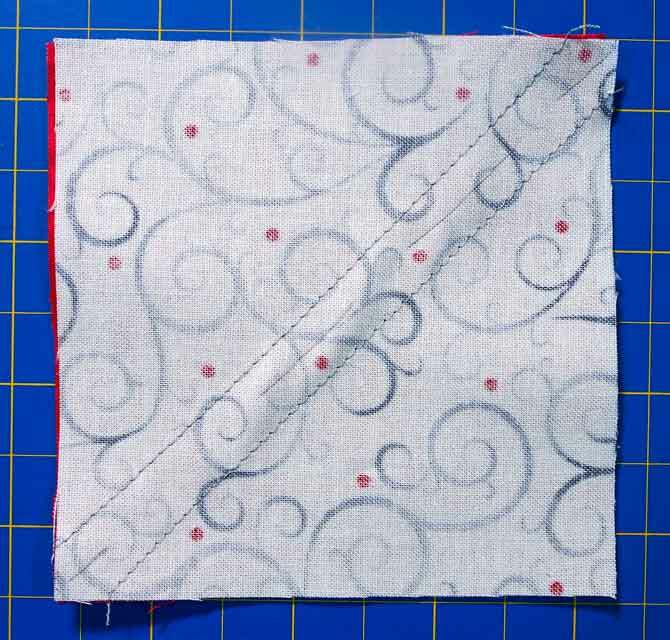 Draw a line, with a pencil or find tipped fabric pencil/pen, in the center cut out slots on the fabric. Sew a ¼″ seam on either side of the pencil line. An accurate quarter inch seam allowance and a straight seam allowance is required to ensure that all the squares come out the same size. Cut apart on the pencil line and press open. The only trimming required is of the dog ears. With this handy gadget the half square triangles are the correct size when sewn together. Wow, that’s awesome as every other method I have used for making half square triangles I end up standing at the cutting table trimming forever – okay maybe not quite forever but some days it feels that way. The other bonus of using this triangle gauge is that there are no triangles to sew together which means no bias edges to stretch out of shape. 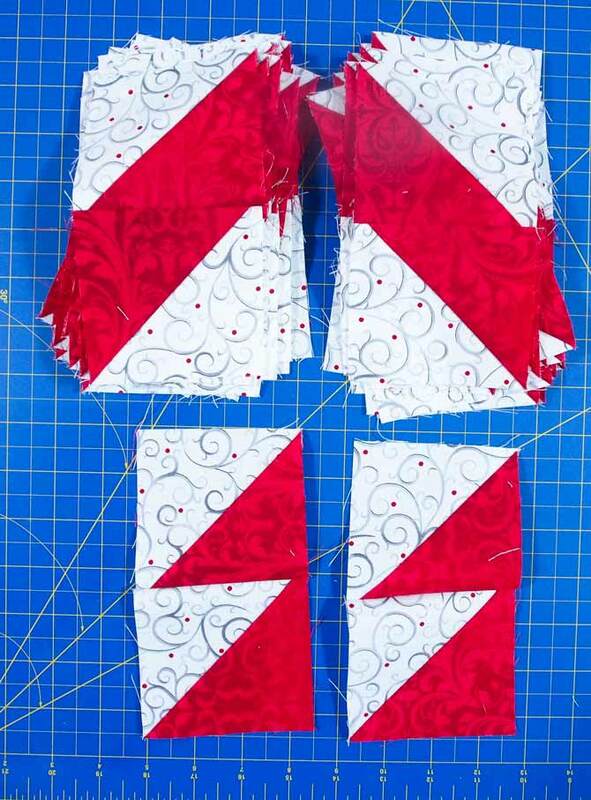 The border design required that I sew the half square triangles in two sets. I placed them with right sides together in two rows on my table so that I wouldn’t get anything mixed up or turned around. It seems that even with the greatest intentions and best laid plans that I still managed to get 2 of them turned around. Oh well, it’s a good thing I’m experienced at reverse sewing (aka ripping out). Once I had all my half square triangles made I sewed them together to form a zigzag pattern with a four patch in each corner to form the border of the tree skirt. Now the tree skirt measures 48″ square. I think that will be big enough – any bigger and it will be a lap quilt. Oh boy, I sure am loving this design but the big white squares and triangles in the tree center around the star are a bit too stark and bare for me. I’m going to have to add some applique to these areas. The tree skirt is coming along nicely and those half square triangles made easy with the No-Hassles Triangle Gauge were a piece of cake. Tune in tomorrow as I add the final touches to this tree skirt. Applique or quilting, which comes first? Looks like a great tool to have!!! Thank you very much! Very interesting post. I’m new to quilting but this explained a lot.